third Hohenzollern king, reigning over the Kingdom of Prussia from 1740 until 1786. "Frederick's achievements during his reign included his military victories, his reorganization of Prussian armies, his patronage of the Arts and the Enlightenment in Prussia, and his final success against great odds in the Seven Years' War. 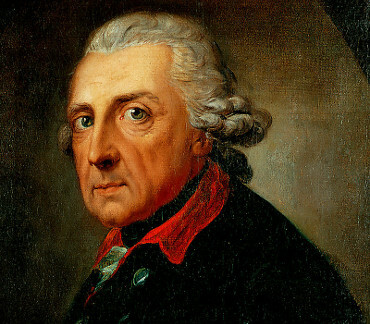 He became known as Frederick the Great (Friedrich der Große) and was nicknamed Der Alte Fritz (""Old Fritz"") by the Prussian people. Frederick was a proponent of enlightened absolutism. He modernized the Prussian bureaucracy and civil service and pursued religious policies throughout his realm that ranged from tolerance to segregation. He reformed the judicial system and made it possible for men not of noble stock to become judges and senior bureaucrats." König von Preußen (1712-1786). 19 autograph letters signed and 1 letter signed ("Federic"). Potsdam bzw. Charlottenburg. 23 Bll. Meist 4to. 4 Briefe auf halbierten oder gekürzten Bogen; zur Überbringung oder zum Versand gefaltet. Mit einer Beilage. 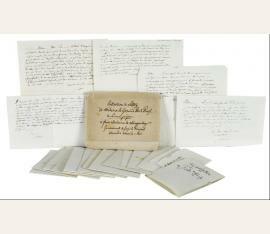 Highly interesting collection of personal letters from the last years of the King's life. In French, to Eléonore de Maupertuis, lady-in-waiting to Princess Anna Amalia of Prussia, Frederick's youngest sister. 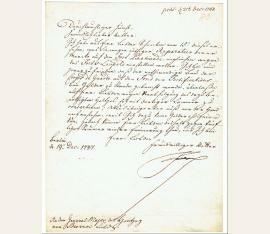 Eléonore was the daughter of the well-esteemed Prussian diplomat, scholar, and translator Kaspar Wilhelm von Borck(e). In 1744 she had married the French mathematician and astronomer Pierre-Louis Moreau de Maupertuis, also a close confidant of Frederick's and head of the Prussian Academy of Science. After her husband's death in 1759 she concentrated on her office in the household of the Princess. - Since 1756 Anna Amalia of Prussia was Abbess of the Quedlinburg Convent but spent most of her time in Berlin. She is mainly remembered for her alleged affair with the Prussian officer and adventurer Friedrich von der Trenck. While the historicity of this anecdote is questionable, she was undoubtedly - and more importantly - one of the 18th century's few female composers of note. 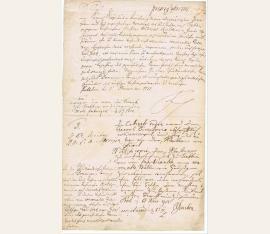 Her music collection ("Amalienbibliothek") contains many important prints and manuscripts, including the autograph of Johann Sebastian Bach's Brandenburg Concerts. She spent her last years in seclusion at Berlin, always remaining in close contact with her brother, who visited her regularly. She survived Frederick's death on 17 August 1786 by just a few months, passing away on 30 March 1787 (cf. MGG I, 486f. and T. Debuch, Anna Amalia von Preußen, Berlin 2001). - There are but few sources for the life of Anna Amalia, many of which are dubious (such as Trenck's autobiography) or focus on Frederick the Great (such as the diaries of Count Lehndorff). Thus, the King's present letters to Eléonore de Maupertuis constitute a unique source for the last years of the Princess. They reflect Frederick's concern for Amalia's health after she suffered a stroke in 1773 and underscore the close relationship between the siblings: "Ma cher Madame, J'ai non recours a Vous pour ne point fatiguér ma bonne Soeur, Com(m)e je suis obligé de ma rendre demain au Parc pour des affaires je me propose des profités en ces Voisinages pour rendre visite a ma bonne Soeur [...]" (Charlottenburg, 2 May 1783). - "Je Vous prie Ma chere Madame, de Conjurer ma Soeur en mon nom de Voulloir prendre quelque Medecine, pour Luy facillitér L'expectoration [...]" (n. d.). - "Voici ma bonne Madame deux Sortes de Tabac pour ma bonne Soeur [...]" (n. d.). - "Je vous prie Ma chere Madame, de m'envoyer Le Nom de Soupes que Ma Soeur mange avant dinér, et une Liste des plats qu'elle aime et qui convienent le mieux en Sa Santé [...]" (n. d.). 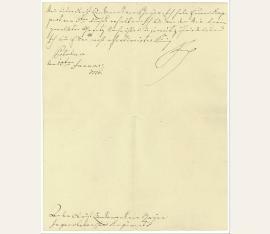 - "Je vous suis bien obligé, des bonnes nouvelles que vous me donnez de la Santé de la Principe ma Soeur, par votre lettre endate d'hier [...]" (6 March 1785). - Almost all letters close with the words "Votre (tres humble) Serviteur Federic". Most of the present letters are a quarter or half page in length and undated; a few are dated only by day but not year ("ce 6 May", "ce 22", "ce 25 Juin", etc.). 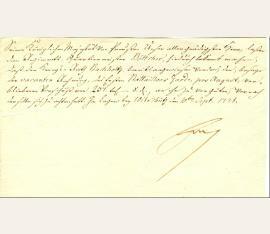 One bears a note by another hand on the reverse ("[...] Potzdam, 1777, Von I. M. d. König"). Only two are dated in full: "Charlottenburg ce 2 May 1783" and "a Potsdam le 16 de Mars 1785". This last letter is written by a scribe's hand, bearing only an autograph postscript and signature by the King. 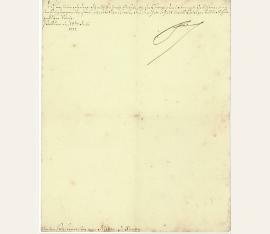 This is also the only letter formally addressed "à la Gouvernante de Maupertuis, neé de Borck, à Berlin". Content and form, however, prove that all letters are from the same time and to the same recipient. 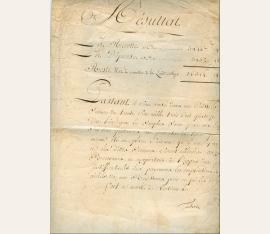 - All letters written in brown ink on fine, clean laid paper, most with posthorn watermark. 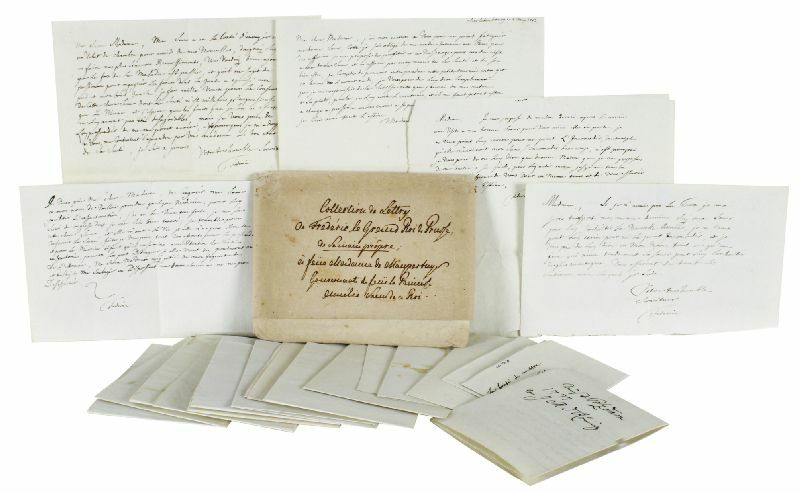 Includes a browned folio sheet (watermark St. Wolfgang, pointing to Georg Friedrich Meyer's Röthenbach paper mill) with late 18th-c. caption: "Collection de Lettres de Fredéric le Grand Roi de Prusse, de Sa main propre; à feüe Madame de Maupartuis Gouvernante de feüe la Princesse Amélie Soeur de ce Roi". - Exceptionally well-preserved collection..
Brief mit eigenh. U. („Frdch“). Friedrich II., der Große, (1712–1786), König von Preußen. Brief mit e. U. („Frdch“). Potsdam, 3. Juli 1783. 1 S. auf Doppelblatt. 4°. – An die Kurmärkische Kammer mit dem Befehl, sich über einen Fall von Amtsmißbrauch zu informieren: „Bey Seiner Königlichen Majestät von Preußen [...] haben die Colonisten, zu Marienwerder Amts Liebenwalde [...] sich sehr beschwehret, über den dasigen Beamten, welcher ihnen, in dem von der Cammer, ihnen angewiesenen Hüthungs-Revier, allerhand Eintrag thun, und sie in einen schweren Prozeß verwickelt hätte [...]“. Die Kammer erhält daher die Ordre, „den Zudringlichkeiten des beamten, ernstlichen Einhalt zu thun, und nicht zu gestatten, daß er die leute weiter chicanire [...]“. – Mit kleinen Randläsuren und einigen zeitgen. Bearbeitungsvermerken. Friedrich II., der Große, (1712–1786), König von Preußen. Brief mit e. U. („Frdch“). Potsdam, 14. Juli 1777. 1/8 S. 4°. – An den neu ernannten Postmeister von Rieben zu Xanten: „Ich will Euch wohl die Hälfte der Chargen- und Stempel-Gebühren für den Euch zugewandten Postmeister-Dienst erlaßen; und habe deshalb bereits Ordre gestellt [...]“. – Gering fleckig. Friedrich II., der Große, (1712–1786), König von Preußen. Brief mit e. U. Potsdam, 10. Januar 1776. 1 S. auf Doppelblatt. 4°. Mit einer Beilage (s. u.). – An Obristleutnant von Boyen im Ingerslebenschen Regiment: „Ich habe Eueren Rapport vom 5ten dieses erhalten. Ich bin von den Mir darin gemeldeten Grentz Nachrichten in so weit zufrieden, und Ich bin Euer wohl affectionirter König | Frdch“. – Etwas knittrig und mit einem winzigen Papierdurchbruch im Mittelfalz. – Beiliegend ein etwa zur selben Zeit von zeitgen. Hand an Boyen adressiertes Kuvert. Friedrich II., der Große, (1712–1786), König von Preußen. Brief mit e. U. Potsdam, 3. März 1754. ¼ S. 4°. – An den Obristen von Beschwitz mit der Zusicherung, „daß wann Ihr Euren Abschied haben wollet, Ich solchen nicht vorenthalten, sondern selbigen ausfertigen laßen werde“. – Stark fleckig und angestaubt. Brief mit eigenh. U. ("Fr[iedri]ch"). 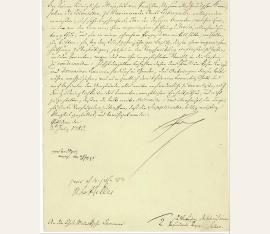 Unpublished letter to August Wilhelm, Duke of Brunswick-Bevern (1715-1781), discussing the construction of fortifications at Fort Peenemünde and Fort Leopold on the Baltic coasts of Pomerania. - Bevern was one of the most experienced and exact soldiers in the army of Frederick the Great; he commanded a wing in the battle of Lobositz in 1756, and defeated the Austrians under Marshal Königsegg in a well-fought battle at Reichenberg on April 21, 1757. Afterwards he took part in the battles of Prague and Kolin and the retreat to Görlitz, and subsequently commanded the Prussians left behind by Frederick in the autumn of 1757 when he marched against the French. 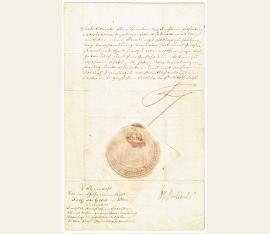 So far unpublished letter to August Wilhelm, Duke of Brunswick-Bevern (1715-1781), discussing the construction of fortifications at Fort Peenemünde and Fort Leopold on the Baltic coasts of Pomerania. - Bevern was one of the most experienced and exact soldiers in the army of Frederick the Great; he commanded a wing in the battle of Lobositz in 1756, and defeated the Austrians under Marshal Königsegg in a well-fought battle at Reichenberg on April 21, 1757. Afterwards he took part in the battles of Prague and Kolin and the retreat to Görlitz, and subsequently commanded the Prussians left behind by Frederick in the autumn of 1757 when he marched against the French. Brief mit eigenh. U. ("Fch"). 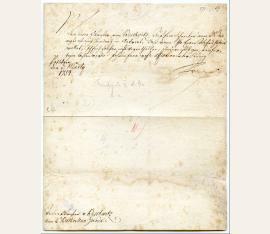 Cabinet order to the War and Domain Chamber of the electorate of the Mark of Brandenburg, concerning a request of the clothworker Christian Andreas Richter. Friedrich II., der Grosse, König (1712-1786). Schriftstück m. e. U. „Federic“, Potsdam, o. D., 1 Seite 4°. Kassenabrechnung der „Landrenthey“. Ein Überschuß von 36.314 Talern und 18 Groschen „sera payé aux Employés sur leurs quittances an prorata du tems qu’ils auront été en place suivant qu’il est fixé […]“ – Leicht schadhaft. 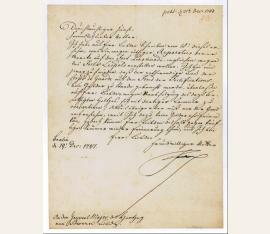 Regimentsquartiermeister Bottcher with the Order, (translated): “Kriegs-Rath Buchholtz, was instructed to balance the open invoice of the First Battalions Garde, for August, advance of the remaining balance of 237 Thaler; I will personally take care of it.” In fine condition, with a central vertical fold.